At times, you or your agents will receive chats from people who mistake you for another company or service. On other occasions, you can get chats from online bullies who want to abuse your agents. Read on to see what to do in such situations. Filter out spam chats using the pre-chat survey. Take advantage of canned responses. To cut down on the number of accidental chats, you can increase the time it takes for your automatic greeting to pop up. When you set it to appear immediately after someone reaches your site, you will get chats with lots of visitors. Including those who reached your site by mistake. They don’t need long to see that they are on the wrong website, so delaying your greetings by 10 or 15 seconds should reduce spam chats. 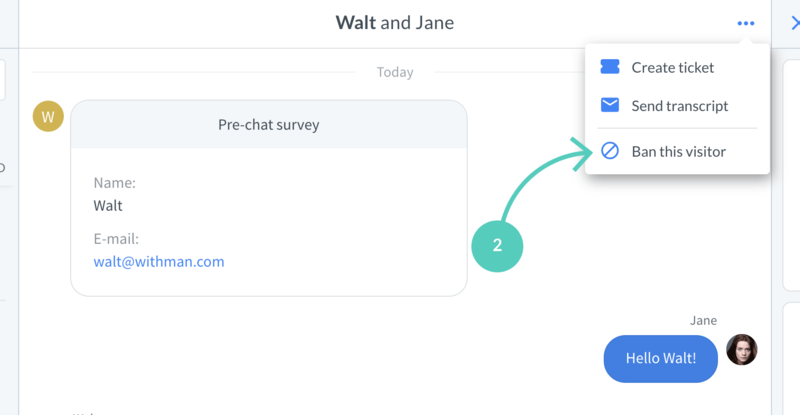 Another way to filter out your visitors is by using the pre-chat survey. 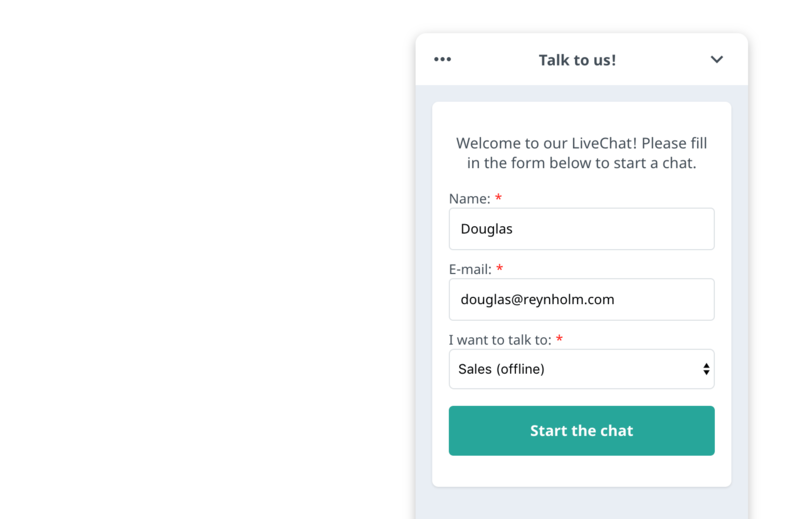 It’s a form displayed to visitors before they start the chat. 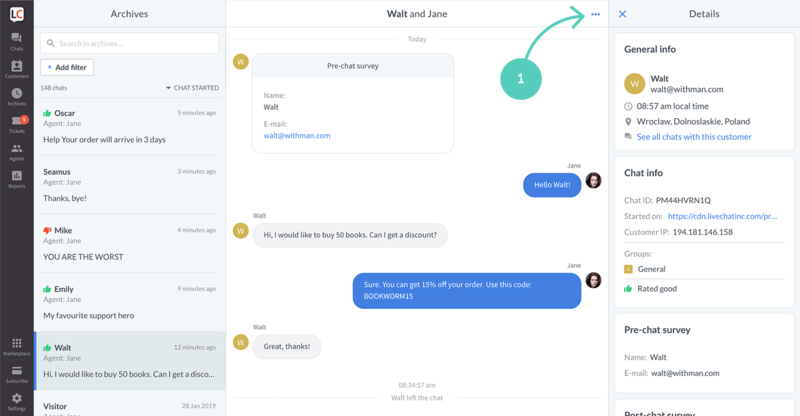 Apart from being a great tool for collecting contact details, the pre-chat survey helps sift serious customers from spammers. Visitors who are genuinely interested in your service will take the effort to fill it out while time-wasters are likely to be deterred by it. You can reduce spam chats to a minimum but you will get one sooner or later. It’s just baked into the cake. It’s important not to lose temper when it happens. You wouldn’t throw a visitor out of your store just because they confused doors, right? Keep calm and let them know they are on the wrong website. It may be a good idea to create a canned response for dealing with confused visitors. It will save your time and goodwill. When you notice that a visitor is intentionally trying to ruin your day, you have two ways out: either end the chat or ban the visitor. Whichever you choose, make sure that the visitor is not simply confused but tries to be rude or abusive on purpose. There are two ways to end a chat: from the chat list and the chat feed. End a chat from the chat list. To finalize, click on Close and archive. Click on the three dots icon “…” in the top right corner. Confirm, by clicking on Stop chat. If closing the chat is not enough and the visitor keeps causing troubles, you can ban them. 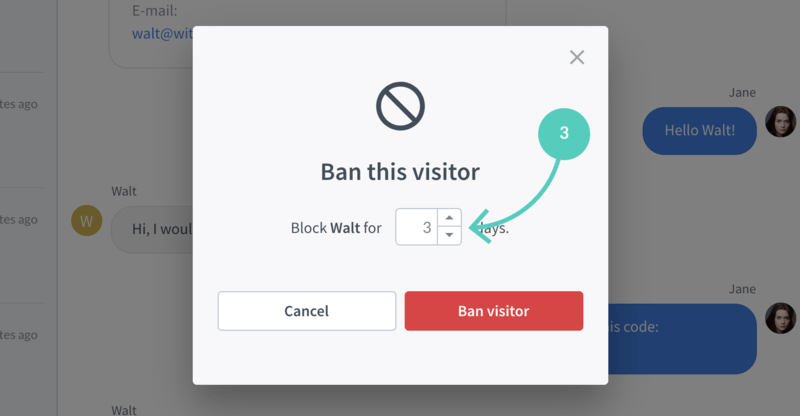 Banning prevents visitors from using your chat, but it won’t kick them off your website. Banned visitors won’t see your chat, won’t appear on the visitors list and will be ignored by automatic greetings. 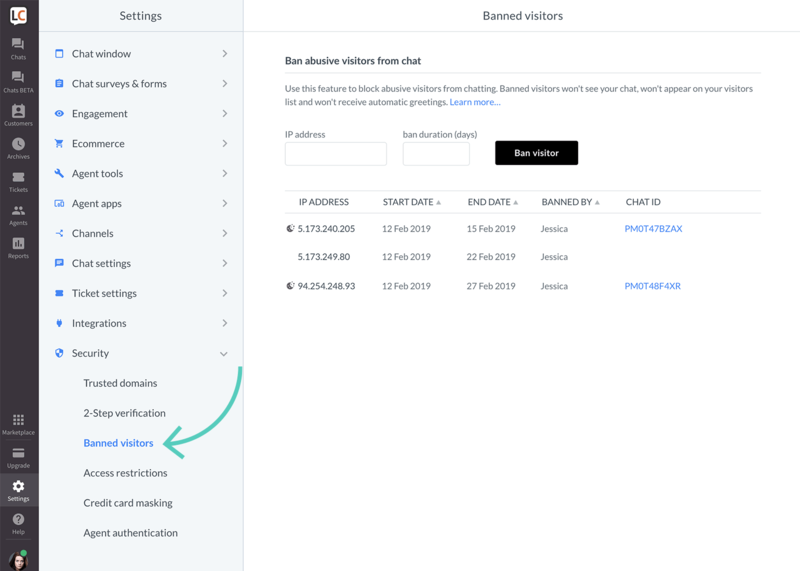 There are three ways to ban unwanted visitors: via Chats, Archives, and by adding IP to the banned visitors list. Click on Ban this visitor. Provide the number of days the visitor should be banned for. To finalize, click on Ban visitor. That’s it. You can see the list of all the banned visitors in Settings. Provide a number of days the visitor should be banned for. Adding an IP address to the Banned visitors list won’t block users with dynamic IPs. To block such visitors, you need to ban them from a chat or archives as it sets an additional ban cookie on their browser. Log in to LiveChat and go to Settings → Security → Banned visitors. Enter the troublemaker’s IP address. If you don’t know the IP, go to the archives and look up the chat you had with the spammer. You will find the IP after you click the chat to see its details. Enter the length of the ban. Finally, click on Ban visitor. All banned visitors will appear on the list below for you to view and manage. Any admin or owner can remove banned IPs from the banned visitors list. To do it, log in to LiveChat and go to go to Settings → Security → Banned visitors. Once there, find the IP address, hover your mouse over it and click the unban button. Done! The visitor can now chat with you again. 71% of people found this helpful.